For some historical perspective, here’s 2012’s version (Nathan Karns the feature pitcher) and 2011’s version (Danny Rosenbaum the feature pitcher) of this post specifically for Potomac/High-A. All stats are courtesy of either milb.com’s Potomac 2013 Stats page or via Fangraph’s Potomac 2013 page. Also useful here are the Big Board and the Nats Draft Tracker since so many of these lower-minors guys are recent draftees. Note: from here on down, there’s more than a few examples of small sample sizes. Plus, I know many readers here were frequent Potomac game attendees and may have different/better opinions than I. Please comment if you disagree with the sentiments here. Potomac starters. The rotation started the season with Ray, Jordan, Cole, Turnbull and Hill. It ended with Purke, Demny, Mooneyham, Solis and Schwartz. There were quite a few changes along the way; I counted 9 promotions throughout the year. Lets take a look at the High-A starters for 2013, starting with the original five and then counting down by the number of starts. Because there were so many promotions, we’ll be referring to the AA and MLB posts frequently here for more detail. Robbie Ray got the ball opening day and never looked back: he dominated high-A in the first half of the season (10.71 K/9 in 16 High-A starts) and continued the great work as one of the youngest starters in all of AA by the time the season was over. See the AA-writeup for more. Outlook for next season: in the Detroit organization. Taylor Jordan gave up just 5 earned runs in his first 6 Potomac starts of the year, quickly earning him a promotion to AA. We all know the story from here; he blew up AA and then gave the MLB team 9 good starts before hitting his post TJ surgery innings limit. See AA’s and the MLB post for more detail. Outlook for next season: AAA rotation. A. J. Cole made his triumphant return to the Nats organization, escaping his hellish 2012 season in the California League by coming back to Washington as bounty for Michael Morse. 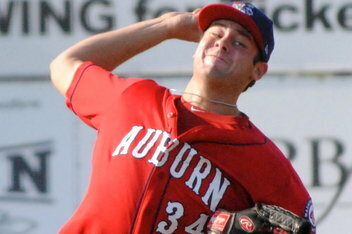 Cole threw about 100 innings in High-A across 18 starts and was 6-3 with a 4.25 ERA. His FIP was considerably better and he averaged more than a K/inning, and the team pushed him to AA as a 21 year old. See AA’s post for more. Outlook for next season: AA rotation to start, looking for a mid-season promotion to AAA. Kylin Turnbull lasted just three high-A starts, giving up 10 runs in 17 innings and was demoted to low-A. See low-A’s post for more. Outlook for next season: Attempting High-A’s rotation again. Taylor Hill threw 84 innings of sub 3.00 ball across 14 starts in Potomac, earning a promotion to AA mid-season. See AA’s write-up for more. Outlook for next season: AA rotation. Blake Schwartz blitzed through 4 starts in low-A and was quickly promoted to Potomac, where he led the staff in starts, wins and innings. He finished the year with an 11-4 record with a 2.65 ERA in 132 innings. His ERA was a bit masked by a low BABIP, resulting in a FIP that was a point higher. He had a nice 4/1 K/BB ratio, a relatively small WHIP, and a decent enough K/9 rate. Another excellent small college find by the Nats scouting staff. 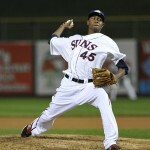 Outlook for next season: You have to think he’s in the AA rotation; what more does he have to prove in high-A? Sammy Solis made it back from Tommy John and gave Potomac 57 innings over 13 apperances with a decent 3.43 ERA. He did miss some time mid-season but came back pretty strong. He was also the P-Nats’ #1 starter in the playoffs, giving them one great and one not-so-great start in the post season. Solis was added to the 40-man ahead of the Rule-5 draft by virtue of his being eligible; now there’s talk about him possibly featuring as a lefty-matchup guy at the major league level. I can see that eventually, but not from the start of the 2014 season. I can see Solis going to AA to get some reps against better hitters and possibly covering for injuries/need later this year. Outlook for next season: AA rotation for now. 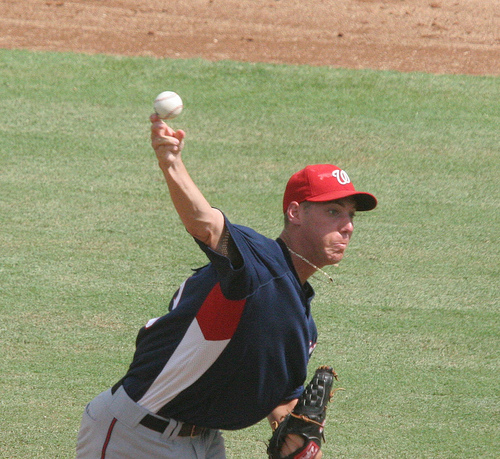 Brian Rauh started the year in Hagerstown’s bullpen as an 8th inning guy, didn’t really pitch that well but was pushed up to Potomac anyway, where he suddenly slotted in as a starter and ended up giving the team 12 starts over 16 appearances with a 4.22 ERA (4.81 FIP) over 64 innings. 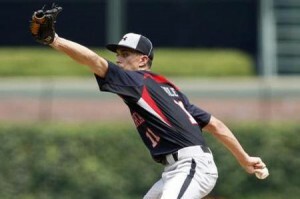 He made way in the rotation late in the season for Brett Mooneyham and worked out of the pen again for the playoffs. Outlook for next season: High-A bullpen, perhaps a starter. Perhaps a release candidate. Matt Purke finally looked healthy after years of shoulder issues. He over matched low-A and was pushed to Potomac in early July. 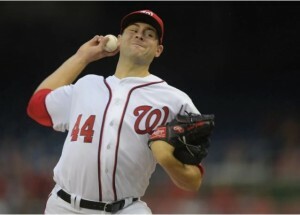 In 12 starts he was 5-3 with a 4.43 ERA, 1.39 whip, and 3.58 FIP. He got the ball in the ghird playoff game and pitched decently enough. What concerns me is his lack of dominance of A-ball hitters; he sported just a 6.05 K/9 rate as a starter in High-A this year. This from a former first round pick, a dominant lefty who was undefeated as a freshman in college in a good baseball conference. What are we to make of him at this point? On the bright side, he’s only 22 and still has a couple of option years left, so the Nats have some time to see what they have (unlike, say with Solis, who is 25 and needs to show something like right now). Outlook for next season: High-A starter once again, looking for a quick promotion to AA. Paul Demny couldn’t make the jump to AA as a starter, and was demoted back to Potomac mid-season. He ended the season in Potomac’s rotation but (likely out of respect for what the Potomac guys accomplished this year) did not participate in the High-A playoffs. In 8 Potomac starts, he was 2-2 with a 3.69 ERA with about a K/inning, which he should have done considering that he’s in his 6th pro season. See the AA post for more. Outlook for next season: AA bullpen. Brett Mooneyham pitched most of the year in Hagerstown before a late-season bump up to Potomac, where he promptly got shelled. See the low-A post for more. Outlook for next season: High-A rotation. 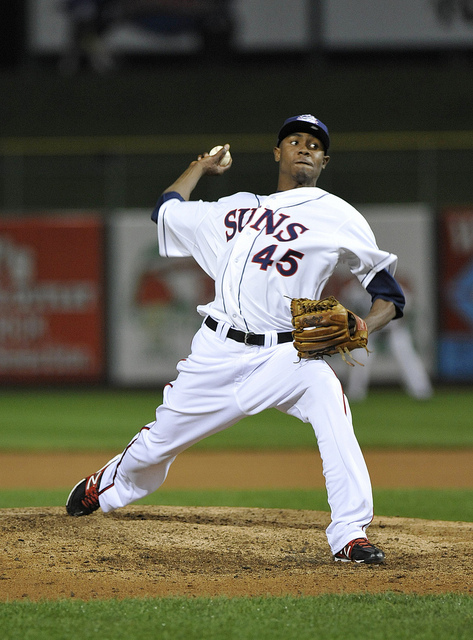 Ivan Pineyro got 3 starts in High-A before he was flipped for Scott Hairston. See the low-A post for more. (Editor’s note: corrected for the right Hairston thanks to John C comment). Brian Dupra got a few spot-starts; see the reliever section. Marcos Frias posted a 7.59 ERA in two starts and a few relief appearances and was released 7/24/13. See the AA post for more. Rob Gilliam made two forgettable starts in High-A before getting pushed up to AA. See the AA post for more. Hector Sylvestre got called up from the rookie league to make one spot start. See GCL post for more. 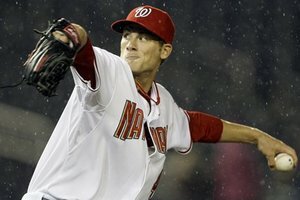 Ross Detwiler and Ross Ohlendorf both made one rehab start for Potomac. See MLB post for more. Potomac Relievers: taking a look at the relief corps. 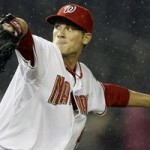 We’ll organize relievers by looking at closers first, then by innings pitched. Robert Benincasa earned 17 saves in 25 apperances for Potomac to lead the team in saves. He earned his promotion after starting the season as Hagerstown’s closer. His numbers on the year: 34/9 K/BB in 30 innings, 3.30 ERA, 1.23 whip, 2.80 fip. His performance earned him a placement in the Arizona Fall League, where he posted a 4.00 ERA in 9 innings of work. Outlook for next season: Depending on the numbers, I could see him in the AA bullpen or beginning in High-A with a look for a quick promotion. 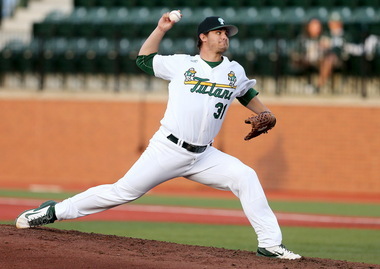 Richie Mirowski dominated to the tune of a 1.50 ERA across 48 high-A innings and earned his promotion. See the AA post for more. Outlook for next season: AA bullpen again, looking to force another promotion. Rob Wort started the season in AA, struggled, missed 5 weeks with an injury, but then settled in as a back-of-the-bullpen guy for Potomac. In 34 innings he posted a 3.71 ERA but more impressively had a 48/29 K/BB ratio. Well, ok, the 29 walks in 34 innings wasn’t that impressive, but the 48 Ks was. Unfortunately for Wort, this is the FOURTH season in a row he’s been in Potomac. He had absolutely fantastic numbers in 2012 but couldn’t back them up. It may be safe to say he’s hit his limit organizationally. Outlook for next season: Another shot at AA bullpen but may end up back in High-A. Greg Holt put up solid numbers as a middle reliever for Potomac, leading the bullpen in innings while going 9-0 with a 3.71 ERA in 70+ innings. I’m concerned with his 55/33 K/BB ratio in those 70 innings; that just seems like too many walks and not enough K’s. He’s progressed each of his three pro seasons; will he keep moving on up to AA for 2014? Outlook for next season: Possibly in AA’s bullpen, more likely back as high-A middle reliever. Colin Bates had a really nice season for Potomac this year, posting nearly a 6-1 K/BB ratio while still striking out nearly 7 guys per 9 innings pitched. He posted a 2.61 ERA over 62 innings pitched, his second straight season advancing a level and posting a sub 3.00 ERA in the bullpen. Outlook for next season: AA bullpen. Brian Dupra earned two promotions on the season to end up in Potomac’s bullpen, where he put up pedestrian numbers (1-7, 4.96 ERA, 1.49 whip). A college senior draftee with very little bonus money investment, Dupra’s usefulness to the organization may be at a limit. Outlook for next season: High-A bullpen competition, possible release. David Fischer started the year in Hagerstown but was quickly bumped up to Potomac, where he served as a long-man out of the pen. He hit the D/L in mid August and never returned. On the year his numbers were pedestrian; 4.30 ERA in 44 innings. He did maintain a great K/9 rate (10.84). But Fischer’s problem is the same as his fellow low-bonus/college senior draftees currently toiling in A-ball; its move up or ship out. Outlook for next season: High-A bullpen. Matt Grace threw 28 innings of quality relief and was bumped up to AA. See the AA write-up for more. Outlook for next season: AA bullpen to continue as the lefty matchup guy. Rafael Martin didn’t make his first appearance until July, and when he got to Potomac he was great; a 1.04 ERA in 26 innings. As well he should; two years ago he was a closer in AA and posted a 1.77 era. What is he doing in A-Ball? The Mexican league free agent signing in 2009 seems like he should be back in AA, where he’s shown he can compete in the past. Outlook for next season: AA bullpen. Derek Self couldn’t make the leap to High-A, getting demoted to Hagerstown after putting up a 6 ERA in 29 innings. See the low-A post for more. Outlook for next season: trying the high-A bullpen again. Tyler Herron quickly showed he was too good for High-A and was promoted to Harrisburg after 20 innings. See the AA post for more. Outlook for next season: AAA bullpen. Christian Meza lasted about 5 weeks in Potomac, putting up a 6.62 ERA and greater than a 2.00 whip before getting demoted back to Hagerstown. See the low-A post for more. Outlook for next season: trying the high-A bullpen again, possible release candidate. 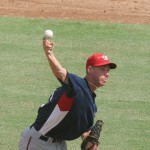 Travis Henke toiled most of the season in Hagerstown and got a late-season promotion. See the low-A post for more. Outlook for next season: high-A bullpen. 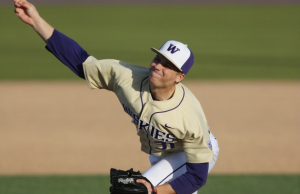 Cameron Selik struggled through 10 appearances and 11 innings throughout the course of the season, missing a ton of time as he struggled with injury. He can’t go back to Potomac for the fourth straight season, can he? Outlook for next season: AA bullpen if healthy, otherwise perhaps an unfortunate release candidate. 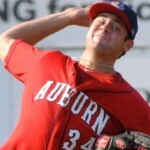 Ben Hawkins threw 8 innings and was released. Justin Thomas threw just one inning in Potomac during his tour of the low-minors this year; see the Low-A post for more. No less than 18 guys got starts this year for Potomac, in a 142 game season. All five of their opening day starters were moved out (four up, one down) by mid-season, and yet the team still made the playoffs. That’s a great testament to the pitcher development going on in our low minors, and I think it is going to show on the big club very soon. Its not hard to see potential in a whole slew of the starters who passed through Potomac this year. 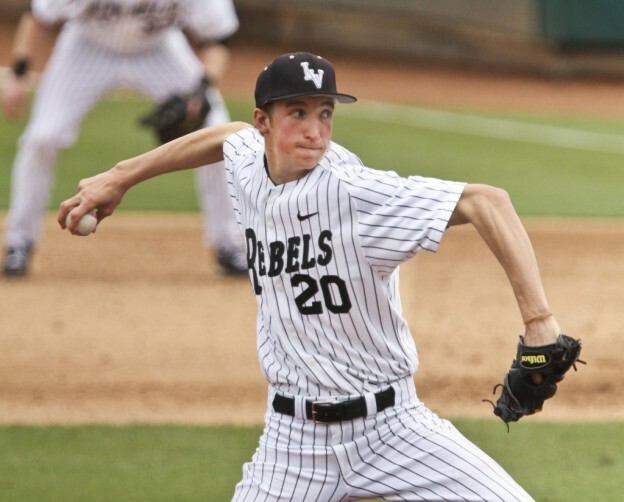 On the reliever side, there’s a couple of guys here who may make an impact, but there’s also a whole slew of right handed middle relievers who were college senior graduates who may very quickly find themselves pushed out by the later crops of college senior draftees.